PCSchool Payroll has released the new Tax Tables for the Australian 2017/2018 tax year. 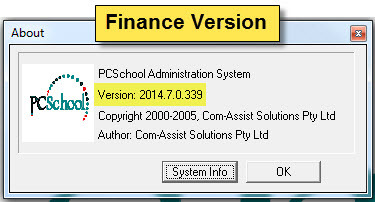 It is recommended that you update to the latest version of PCSchool – Curric version 2016.0.0.521 / Finance version 2016.0.0.194. Providing you have completed your final Payroll Payment run for 20176-17 tax year then download the latest followup available from our website. You may use either the pre followup version or the newly downloaded Finance.exe to prepare payment summaries for the 2016-17 tax year. The format of Payment Summaries has changed for 2017-18, and these changes are in the Followup, however for 2016-17 the ATO will accept either format. Download the followup and extract the files to \pcschool\programs on the server. These should then automatically flow down to user clients machines when next they run PCSchool. To use the new Payment Summary print format you will need to take the Followup and download the new report. The new report needs to be downloaded and saved to \PCSchool\Reports\SQL on your server. (You will know you have the new print format if the Payment Summaries you produce have a Type for Gross Payments and an extra section to indicate if your organisation is exempt from FBT under section 57A) Should your current Payment Summary contain customization eg school logo then you will need to get these reports (GrCert?.rpt) modified to incorporate the compulsory ATO modifications) before they can be used in the 2017-2018 tax year. Once all pays for the 2016/2017 tax year have been completed then proceed to to update your tax tables as below. You can download the tax scales here. Download the file and extract contents to \pcschool\data on the server. If you run Multi Workareas you will also need to extract to those workareas eg \pcschool\other workarea name also on the server. 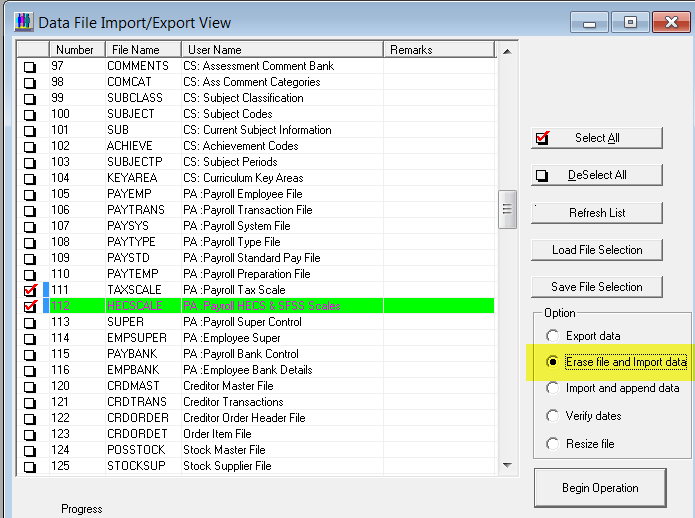 In each desired workarea go into Finance > Utilities > Data Import/Export. Select files 111 and 112. Change option to Erase and Import and Begin Operation. 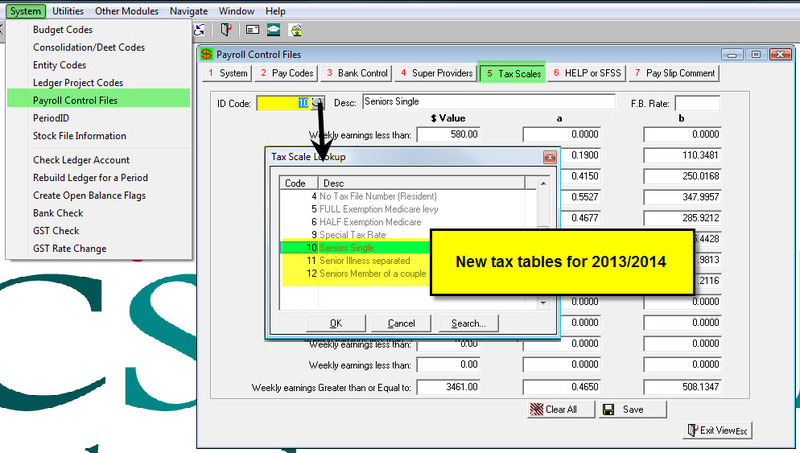 Check your Tax, Scales, HELP and SFSS Tables have been updated, these have changed. To allow for the need for increasing flexibility in Attendance Roll Marking PCSchool has made some changes to the Timetable Period Descriptions in Version 2016. Changes will allow schools to create periods for each day in the timetable where the number of periods in the day or length / duration of the period differs. To allow for this the ‘Code’ for each period has changed in format (is not system generated) and a Time Period column has been added. Changes should not affect most schools, however if schools have previously assigned Year Level Restrictions to periods these may need to be revisited and updated to allow for the new logic as outlined below. Cost Centres can now have Multiple Discounts added directly through a Discount Table; this is an alternative way to running the Discount through Quick Family Accounting Adjustments. This new feature is a major improvement allowing schools to apply not only sibling discounts against school fees during the billing process, but also additional discounts / rebates such as staff discounts, parish discounts and hardship discounts. 7/4/2019 Scholastic 2018.0.0.470 Extended output options in Assessment Related reporting to cater for greater use of Freedom. Important bug fix to version 2018.0.0.438 where changes led to incomplete selection of eMail addresses in . Adjusted code to set images table self correcting under Freedom. 4/4/2019 Debtors 2018.0.0.308 Bug fix where reprints of some debtor receipts were being misdirected under Freedom. 21/3/2019 Finance 2018.0.0.200 Added additional functionality to Ledger Budget Import enabling the re-importing of Prior Year budgets and enabling the importing of a revised current year budget based on an annual figure distributed according to previously established monthly distributions. 21/3/2019 Debtors 2018.0.0.304 Added facility in Batch Billing to enable schools to run a catchup billing based on Discount only. Where schools wish to rerun discounts only for families previously billed but where discounts were not applied at that time. 21/3/2019 Scholastic 2018.0.0.438 Extended output options in Assessment reporting to cater for greater use of Freedom. Corrected bug when verifying counters to ensure images added through Spider are considered in the calculation. NZAQ Standard import Fixed bug where standards with option of Digital Exam were not being correctly taged in Back Office. Schools need to download Followup then re-import the latest standard file. 10/3/2019 Debtors 2018.0.0.298 Modifications to Account Printing and Sundry Account Printing as well as Voluntary Payments printing to better align them with the Freedom Model, enabling output under the Freedom Model without the need to use a Tagset. These modules now support “All families” without using a tagset. 8/32019 Scholastic 2018.0.0.421 New Zealand NZQA Result import. 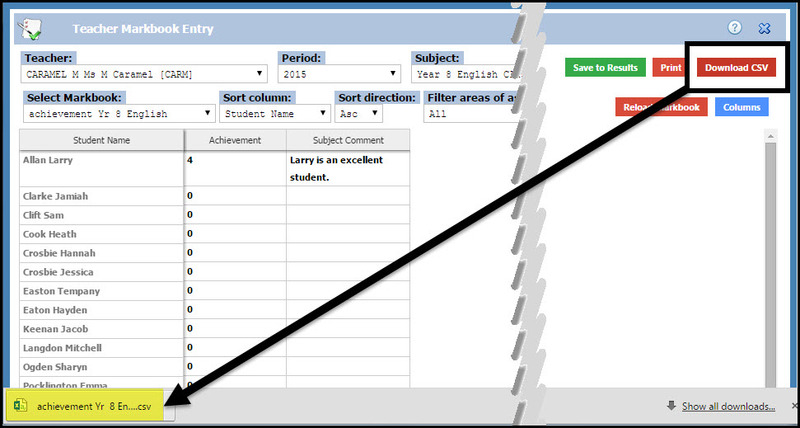 Added addition identifier (Given name) to error report to assist in determining student. 25/2/2019 Curric 2018.0.0.374 MOE Data Submission., Advised by MOE to report STP provider 11 as not a valid entry owing to to-days advice of liquidation of this service provider. 22/2/2019 Curric 2018.0.0.373 Government data submissions. MOE NZ Roll Returns added support for electronic approval and submission. NAPLAN data captures of student and care-giver details, tweaked for freedom to ensure only active care-givers are checked for items such as language. Student Import added Freedom model support to csv imports. 20/2/2019 TimeTable 2018.0.0.46 Tweaked TimeTabler import to cater for minor change in the way custom entries are expressed in sCourse from TimeTabler. 8/2/2019 Curric 2018.0.0.343 Markbook creation modification. Added support in Areas of Assessment of type “data” to address a data field where the subject period specified is dynamic, based on the current subject period when the markbook was created. When identifying the subject period to be used you can now specify a period of eg -1.0. Should this be the case and the markbook is for subject period 19.1 then the specific data column will draw data from subject period (19.1 – 1.0) ie Pd 18.1, in other words from the previous year. 27/12/2018 Curric 2018.0.0.310 Added support to use sort order in Area of Assessment allocation when creating new markbooks. 14/01/2019 Curric 2018.0.0.304 Bug fix to ensure logged in user is user passed to MOE Dex server in Arrivals and Leavers submissions. 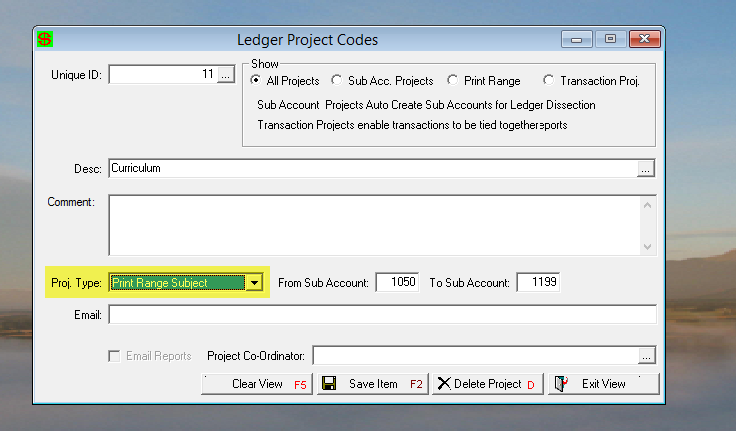 9/1/2019 Finance 2018.0.0.167 Adjusted ledger Transaction Entry for Payments batch where a payment is referenced to a specific Payee Creditor code then the default ledger dissection for that creditor is shown as default in payment entry dissection. 18/11/2018 Curric 2018.0.0.215 Adjusted code to cater for Google’s change of policy enabling access to Google Geo code mapping control fixing Goggle poll error when entering an address. Addressed condition in eAsttle upload where error condition triggered by a space in front of NSN. Minor screen change to cater for Freedom email options in emailing Assessment reports. 13/11/2018 Finance 2018.0.0.142 Ledger Model Accounts added Campus to KPI student and Teacher counts. Also catered for in Spider KPI reports. Requires a Spider Ver 2018.11.13 minimum. Fixed payroll bug associated with Sick and Holiday pay not adding to hours accrued at a Pay Table. 12/9/2018 Curriculum 2018.0.0.160 Primarily for Freedom schools. Updated ACARA export to extract based on Freedom Model. Modified eMerge to be sensitive to Family eMail options set in the Freedom model. Added Freedom sensitivity to Assessment Reports for eMailing. 16/8/2018 Curriculum 2018.0.0.119 Added support for new Age/Grade census for NT schools. Added support for Assessment report printing based on the Freedom Model for schools that have converted to Freedom using the new communication options available in Freedom. Added capacity to read in up to 4 simultaneous import co-curriculum records in Student Import by csv. 2/7/2018 Curriculum 2018.0.0.106 Fixed bug in NZQA Standard import for Digital Assessment options. Importing standard file was not importing the assessment options. 28/6/2018 Debtors 2018.0.0.154 Added facility to import FACTS early settlement discounts into AutoBill Batch. Curriculum 2018.0.0.97 Added support for Freedom Model in Government reporting for Australian schools to return care-giver levels of education etc based on the Freedom model. 7/5/2018 Debtors 2018.0.0.123 Added data import for modified CBA-EVOLVE Card format to import payments directly into receipts. 1/5/2018 Curriculum 2018.0.0.63 – Added support for Freedom schools to cater for Account EMail owner to write this address to Identity.EMail_Billing and to change Caregiver email from Identity.EMail to Identity.EMail_Home this ensuring that Identity.EMail is reserved for School or Business email address. 3/3/2018 Debtors Ver 2018.0.0.68 Added functionality to Account emails to embed the Payment Plan commitment amount into the account email body enabling schools to advise caregivers of the regular amount that will be withdrawn from their accounts. 3/3/2018 Finance Ver 2018.0.0.9 Bug Fix. In ver 2018.0.0.7 (27/2/2018) we released a bug in the printing of employee payslips that resulted in the display of duplicate references to banking’s made as a result of that pay. This fix only applies to users who took the followup from 27/2/2018 – 3/3/2018 Finance Versions 2018.0.0.7 or 2018.0.0.8. This release in Ver 2018.0.0.7 addressed any rounding errors that occasionally occurred when displaying employee banking’s. 23/5/2017 Curriculum Ver 2016.0.0.521 Fixed bug in MOE reporting where program reported that the selected file name was incorrect. 14/5/2017 Curriculum Corrected duplicate error message associated with duplicate Alumni Activities when a student is departed, re-enters and is then departed again. 4/4/2017 Debtors Ver 2016.0.0.230 Encrypted Credit Card details to render PCI ready. 18/11/2016 Curriculum New Zealand Ver 2016.0.0.307 Added import of University Entrance Approved standards as part of the standard import routine. The import requires the presence of the UEApproved.csv file which is now shipped along with the latest Standard.zip file. Extract the UEApproved.csv file along with the Standard.txt file to the same folder location. The standard import routine will do the rest. 7/11/2016 All modules From Address using Print Q. It is now possible to enter a generic “From Email Address” when processing bulk emails. 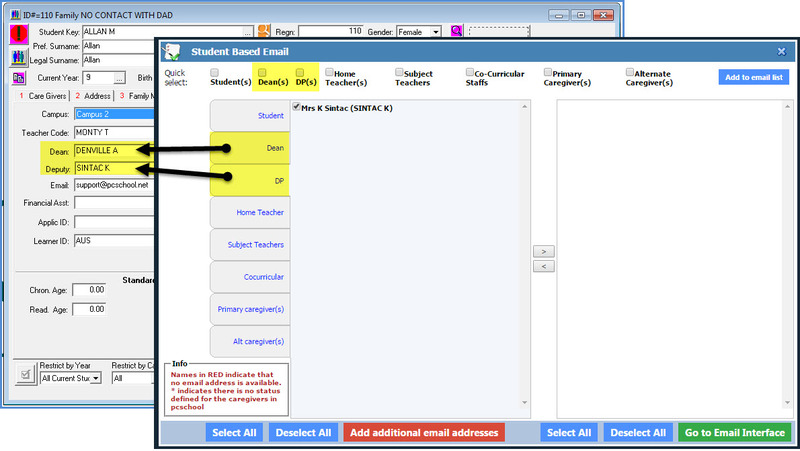 This enables the system to show the email as from “noreply@school.com” or “account@school.com” instead of using the actual from address of the logged in user. 3/10/2016 Debtors Ver 2016.0.0.108 Added Cutoff time to import of OnLine Payment entries enabling the user to set the time at which the Secure Payment provider closes off transactions for the specific day. This enables receipt batches to reflect all transactions prior to this time and hold over latter transactions to the subsequent day. 13/5/2016 Finance Ver 2016.0.0.62 Payroll. 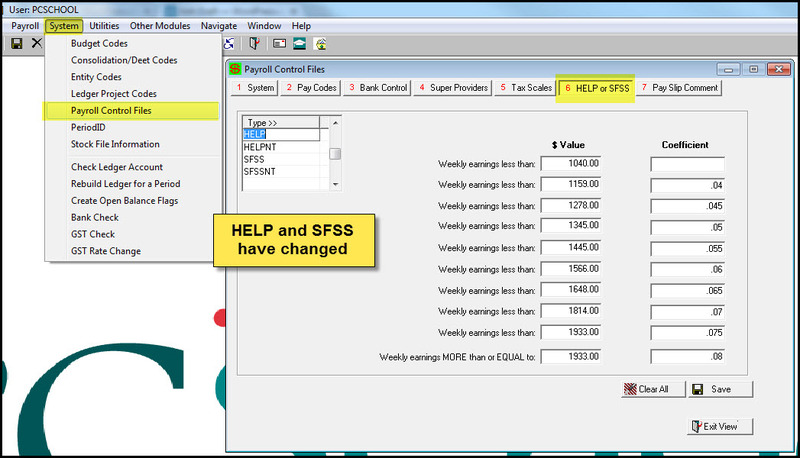 Added facility to edit Deduction amounts prior to Payroll Generation without the need to create Time Sheets. A much faster way to enter routine deductions such as Staff Lunches etc. 22/3/2016 Finance NZ Release of NZ Tax Scales for 2016 – 17 tax year. 22/3/2016 Finance Ver 2016.0.0.11 Corrected anomaly in the Monthly Super calculation associated with using a second Monthly Super line. 15/3/2016 Debtors Ver 2016.0.0.46 Receipting Added PCSQ to receipting to support Email and Document Management via PCSQ thereby supporting Office365 as the SMTP server within the receipting module. 15/3/2016 Curriculum Ver 2016.0.0.72 Changes to Absence Roll Collection and Trigger to better cater for new flexibility in Period and Day definitions. 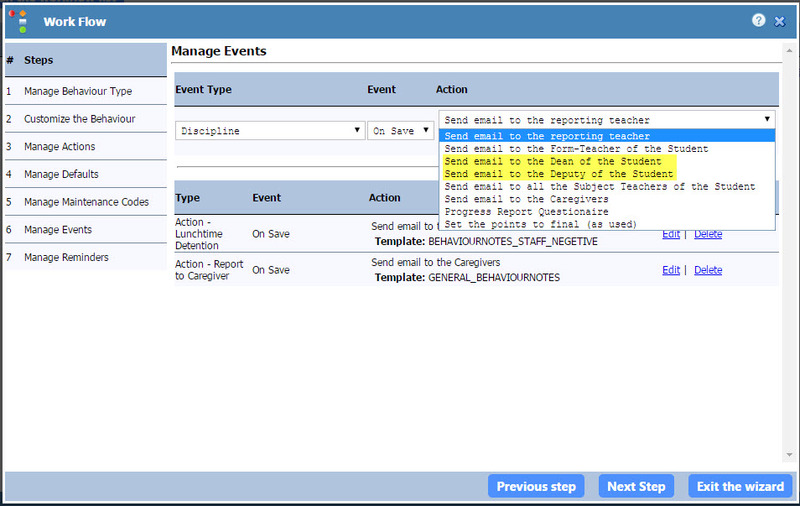 Added a functionality to Early Notification to enable user to set the system to ignore unexplained absences, should the child arrive at the school at a later period in the day, there by not sending the parent a notification for unexplained absence if the child has subsequently arrived at school. 15/3/2016 Curriculum Ver 2016.0.0.72 Changes to Attendance Analysis reports significantly speeding up the production of these reports. 10/02/2016 Curric Ver 2016.0.0.46 Changes to Absence Roll Marking to cater for roll marking by full year level groups eg “show roll with all students from Primary School”. Misc tweaks and minor bug fixes associated with Roll Marking and Timetable to ensure new Time Period Header model caters for all varied school situations, to increase the flexibility and function of roll marking, associated with varying period lengths and differing periods on certain days, or for particular year levels. 17/1/2016 Release of 2016 Data Structure changes. Where users have not received an email notification they should contact PCSchool for advice on download. 17/1/2016 Debtors Ver 2016 Added a new table for entering multiple student discount structures, removing the need for the Discount Calculator as sibling discounts are now calculated as the invoices are created. PCSchool Payroll has released the new Tax Tables for the Australian 2015/2016 tax year. 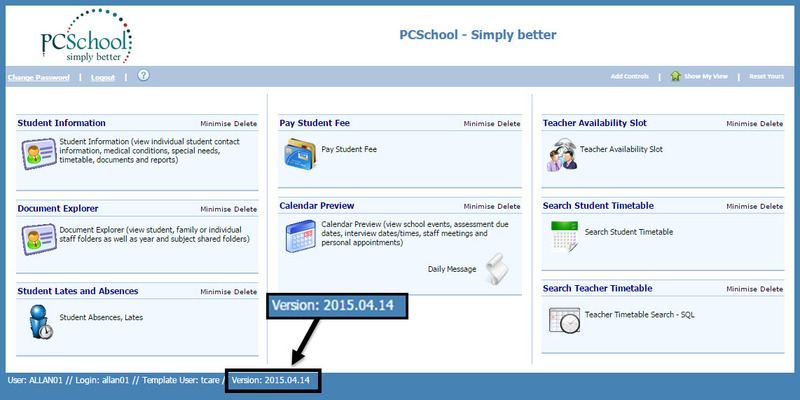 It is recommended that you update to the latest version of PCSchool – Curric version 2014.7.0.892 / Finance version 2014.7.0.339. Download the latest followup available from our website. Download the followup and extract the files to \pcschool\programs on the server. These should then automatically flow down to user clients machines when next they run PCSchool. Once all pays for the 2014/2015 tax year have been completed then proceed to to update your tax tables as below. Once the followup update has been installed go to Help – About within the Finance Module and check your version number. 07/05/2015 – Administration control. Access now enabled on this control. Users must have ‘Spider Update Administration’ security item in User Rights Equivalence to be able ‘update controls text’ and ‘update configuration file’ in the Administration control. Available in Spider version 2015.05.07 and above. 04/05/2015 – Markbook V2. Decimal validation added, setup via Result Table type in Back Office > Curriculum Control Files. Now allows numeric values WITH decimals and WITHOUT decimals to be entered into markbook. Available in Spider version 2015.05.04 and above. 30/04/2015 – Web Based Purchase Orders. Now supports GL project types of ‘Print Range’ or Order Projects. Available in Spider version 2015.04.30 and above. 29/04/2015 – Markbook V2. Added ability to Download to CSV in markbook. Available in Spider version 2015.04.29 and above. 29/04/2015 – Markbook V2. Added new AVERAGE formula. Allowing to average marks across certain columns excluding where no mark given. Available in Spider version 2015.04.29 and above. 14/04/2015 – Incident Tracker. Security enhanced to restrict view and setup rights and who can create certain TYPES of incidents. Available in Spider version 2015.04.14 and above. 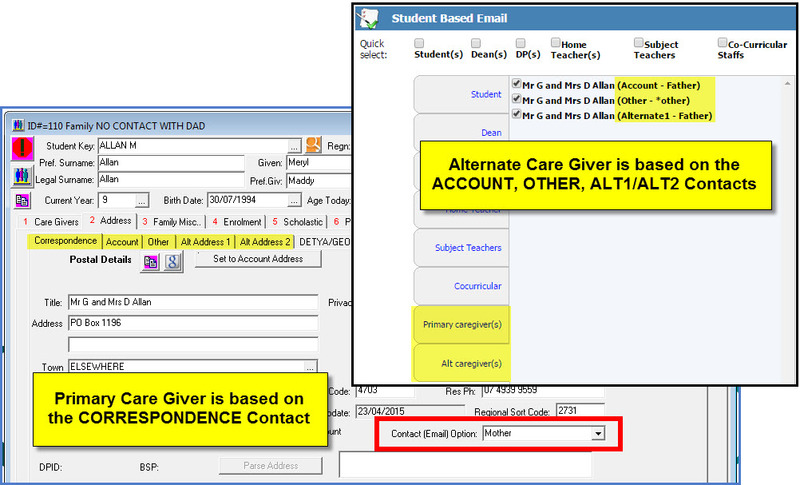 09/04/2015 – Email Selection now includes tab for ‘Primary Caregivers’ and ‘Alternate Caregivers’ and shows the address tab the contact is attached to and the contacts status. Available in Spider version 2015.04.09 and above. 02/04/2015 – Email Selection now includes students Dean and DP (Deputy Principal). Available in Spider version 2015.04.02 and above. 02/04/2015 – Behaviour Workflows email selection now includes students Dean and Deputy. Now allows multiple actions in a workflow. Available in Spider version 2015.04.02 and above. 02/04/2015 – Markbook V2. Available in Spider version 2015.04.02 and above. Data saving is now case sensitive. Allows you to save both ‘n’ and ‘N’ or change ‘n’ to ‘N’. If the student has withdrawn from a Standard / area of assessment, it will show in orange and the column will be locked restricting changes.